Vivaer Airway Remodeling is a new, non-invasive in-office procedure to help you breathe more easily. Millions of people suffer from nasal airway obstruction, which limits airflow through the nose. Until now, your only options were medications or breathing strips that offer temporary relief, as well as surgeries that are invasive, painful, and often have a long recovery period. VIVAER uses a small handpiece in the office to reshape the tissue inside the nose in the nasal valve region to improve airflow, without any incisions. Clinical studies have shown that 92% of patients notice an improvement in breathing after VIVAER. Simple in-office treatment is completed using only local anesthetic, allowing you to return to normal activity right away. Try this do-it-yourself diagnostic procedure for assessing nasal obstruction. 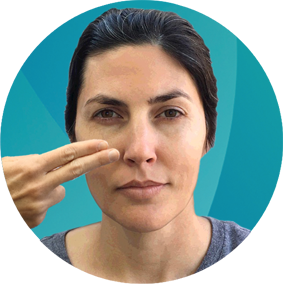 Place one or two fingertips on your cheeks on either side of your nose. Gently press and pull outward. This temporarily opens the nasal valve. If doing this helps you inhale more easily through your nose, your nasal obstruction may be in your nasal valve, and you may be a candidate for VIVAER Nasal Airway Remodeling.